A dessert that’s healthy? You bet. This fruit parfait combine a variety of chopped fruits and quinoa with coconut oil and honey to make a yummy-nummy dessert. Now, we are supposed to eat 5 portions of fruits a day BUT WHO DOES THAT? Well, this recipe will make sure you eat at least 3 of them! Add nuts or an extra dash of coconut oil. 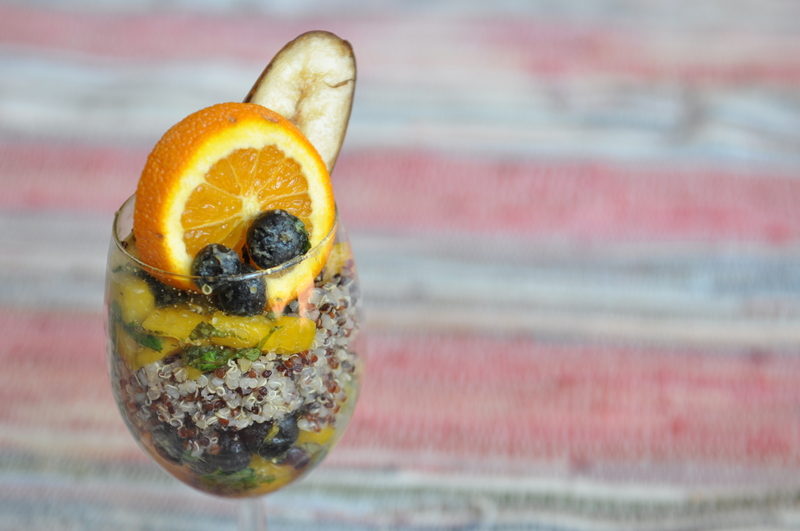 NOTE: You can use any fruits you want to make this parfait! Try it with strawberries, kiwi or red dragon fruit. We hope you enjoyed this SUPER nutritious, SUPER delicious dish. 1) Wash and rinse the mango, blueberries and mint leaves. 2) Next, chop the mango and mint and slice the banana. Set aside. 3) Juice the orange and set aside the juice. 4) Next, in a large bowl add coconut oil..
5) Add the mango, blueberries, sliced banana, chopped mint leaves and orange juice. 6) Add the honey and gently, mix the fruits together. Be careful not to bruise the fruits. 7) Once the fruits, honey and coconut oil are properly mixed together, take your dessert glass and add a layer of quinoa at the bottom. 8) Next, scoop a layer of fruit mix onto the quinoa. 9) After that, add another layer of quinoa and another layer of fruit. Repeat until glass is full. 10) Garnish with a mint leaf. 11) Grab a spoon. Enjoy!